It’s a comedy like no other and it ran from February 1999 to June 2002 and only spanned 4 volumes, yet proved to be popular enough that it was aired on TV Tokyo in a rather odd format. Each episode was only 5 minutes long and for the weekend a repeat of all 5 was pushed together into one 25 minute episode. For the DVD release a title and end credits were simply added. I have to admit I’m not 100% sure on where to start even attempting to explain this one, so bare with me while I have a bloody good go. 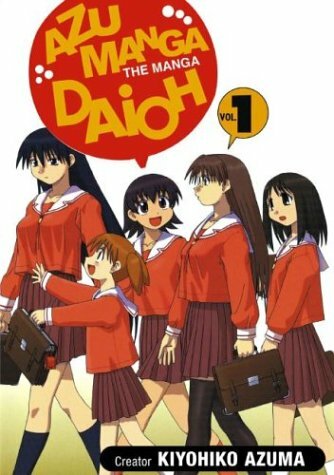 Okay let’s start things off simply; it’s a manga about a group of girls in high school. That’s simple enough right? It follows the story of 5 girls on their rather odd journey through high school. It has your basics such as the child prodigy trying to make it with high school, the simple girl from Osaka who just doesn’t quite get it, the odd girl who gets bitten by a rather nasty cat (over and over again), the loud girl and the smart girl as well as a rather perverted teacher or two. As mentioned, it’s a comedy and you know, it does work pretty well. Yes a lot of the humour can be lost through the translation, but both the manga and anime explain it well. Plus, it does have some very laugh out loud moments, if not a few that leave you with a pretty confused expression. However I personally feel the anime certainly portrays the humour much better than the manga. I also have to admit that the English Dub of the original Japanese anime is very good! (This is pretty rare as most Japanese anime fans prefer the original Japanese voices with English sub titles). The art style is perfect as it’s simple, uncluttered, very modern, and unlike normal manga it is drawn in the style of Yonkoma or 4 cell manga. Give it a shot; it’s the kind of manga that all the cool kids are quoting.